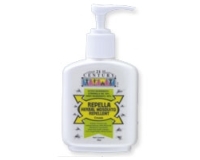 Repella Herbal Mosquito Repellent contains a safe and effective blend of Citronella Oil and other natural insect repelling herbal extracts in a moisturising lotion base. If swallowed - Induce vomiting by giving a tablespoon of salt in a glass of warm water. Repeat until vomits is cleared. Call a physician immediately. If in eyes - flush eyes with plenty of water for at least 15 minutes. Call a physician immediately.